Indonesians have mobilized in record numbers to collect cash for the Australian PM, who touched a raw nerve by bringing up Australia’s $1 bn in tsunami relief aid to Jakarta while making a clemency appeal for convicted drug traffickers. Images of Australian Prime Minister Tonny Abbott with red tape crossed over his mouth can be seen all over Indonesia, particularly in Jakarata. 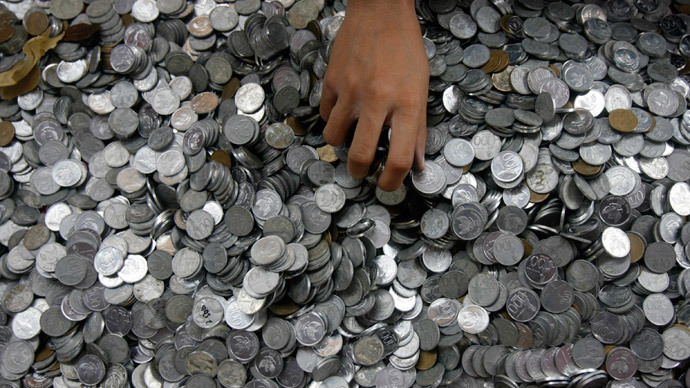 Loads of silver coins are covering banners spread on the ground – all part of the “repay” protest campaign that has spread like a bushfire across the island nation. As part of the international relief effort for the 2004 earthquake and tsunami off the west coast of Sumatra that killed more than 100,000 people, Australia was quick to offer $1 billion in aid relief. Speaking this week, Abbott hinted that it is time for the Asian nation to repay its debt by freeing two members of the famous Bali Nine, currently on a death row. The Bali Nine was a name given to a group of nine Australians who were arrested in Bali in 2005 Bali for planning to smuggle 8.3 kg (18 lb) of heroin, valued at over $3 million, from Indonesia to Australia. @TonyAbbottMHR "Protesters compare Abbott to Shakespear moneylender Shylock at #bali9 protest at Indo roundabout pic.twitter.com/bn2I266iqj"
The plea sparked a fierce backlash, with Indonesians comparing Tony Abbott to Shakespeare’s Shylock, the moneylender in The Merchant of Venice who demanded a pound of flesh if his loans weren’t paid back. Hey You !! @TonyAbbottMHR ! This is Coin for your Country #CoinForAustralia#KoinUntukAustraliapic.twitter.com/8FnrlseL4j"
"Australians need a prime minister, not a Shylock and drug dealer's cousin," read a banner during Sunday’s protest. A Twitter campaign using the hashtags #KoinuntukAustralia, #coinforAustralia and #coinforAbbott has also generated a lot of steam. While on the diplomatic front, the country’s leadership seemed satisfied by the explanation offered by the Australians on Friday, many ordinary Indonesians remain enraged. During a protest on Sunday, thousands rallied to express their anger and continue to coin collection campaign. The Pro-Indonesia Coalition, for example, organized a “Coin for Australia” movement during a car-free day at a roundabout near Hotel Indonesia. “Let us not let our dignity being bought by Tony Abbot,” action coordinator Andi Sinulingga said at the event. Indonesia plans to execute 11 convicts on death row, including the drug convicts from Australia, Andrew Chan and Myuran Sukumaran, whose clemency pleas had been rejected by President Joko Widodo. Earlier this week, however, the vice president's office said that the execution of two Australian smugglers had been delayed by up to one month. Indonesia executed six drug offenders in January, including five foreigners, prompting Brazil and the Netherlands to recall their ambassadors.